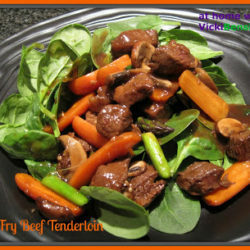 Quick & Easy Nutritional Meals without a Recipe! I admit I have a cookbook fetish with 100s lining the shelves in my home kitchen, downstairs, bedroom closet, nightstand, and just about anywhere else you can think of. The truth is though, I use them mostly for inspiration. Oftentimes, I’ll try a cookbook recipe, then change it to suit my taste and my families. However, most often I don’t use a recipe at all. I tell my clients they can do this as well, if they just follow their instincts. You know the foods you like, don’t you? You know the flavors that taste best on your palate, don’t you? Cooking doesn’t have to be an all day event or one that you tediously sweat over to follow a recipe. Sure there are those recipes that you want to duplicate like the photo. Having never tried it before you carefully read over, and over, the recipe to insure you don’t miss a thing. Just like I did on my Boston Cream Pie. More often than not, simple, is best – tastes better, and is healthier for you. Last week was crazy! I barely had time to breath, let alone find time to go to the grocery store, then come home to cook – but I did! My family counts on me for that, yours may as well. I certainly didn’t have a minute to browse cookbooks for fancy or sauced up recipes. So what did I do? The same thing I tell my clients to do! Head over to your favorite grocery store (mine is Whole Foods) – and let your eyes decide what’s on the menu. When I walk into Whole Foods, my eyes immediately gravitate to the beauty of all the fresh, colorful produce so artistically displayed in baskets on tables, lined and sorted neatly in refrigerated coolers with germ free samples of nutritious earthly goods. Who can resist? Oftentimes, before selecting the fruits and vegetables I want to serve with my meal, I’ll head over to the fish and meat department to see what looks best, and if they have any specials. On this particular day the fish department was sampling Swordfish, not what I’d had in mind when walking in, but it was so fresh and flavorful, I selected that. I went back to produce and gathered up all that looked pleasing to the eye, and felt would blend well together. You don’t have to be a brainiac to do this. Go with your gut – you know what you like. What you’re unsure of, ask someone in produce, they most likely will offer suggestions. A simple dish of Swordfish, with mounds of grilled summer vegetables, drizzled with fresh squeezed lime juice, completely satisfied my family. Not one carb was at the table, and they didn’t miss it. You too can make dishes like this using basic ingredients of just olive oil, fresh squeezed lime/lemon juice, salt and pepper to add more depth of flavor. No slaving, no fuss, no sweat! Rinse fish and pat dry with paper towels. Drizzle both sides with olive oil then season with salt (Sea or Kosher) and freshly ground pepper. Set aside. Place cut vegetables in grill pan (or roasting pan if cooking indoors) and lightly drizzle with olive oil and toss vegetables to blend, along with the corn. Put veggies on a medium grill, cook for approximately 20 minutes or until softened but not gushy, stirring vegetables and rotating corn about every 5 minutes to insure even heat distribution. After veggies have been on the grill for 10 minutes add Swordfish. 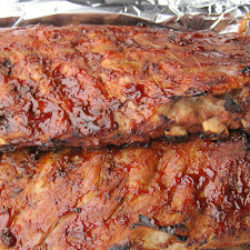 Grill 4-5 minutes per side. Remove Swordfish after 10 minutes of grilling and 20 minutes of grilling vegetables. Pile grilled veggies in the center of a large plate or bowl, gently lying Swordfish steaks onto vegetables, surrounding the plate. Garnish with sliced lime wedges. Serve. Light, refreshing, satisfying and nourishing. What more could you ask for? If there are leftovers the next day, use them in a salad, omelet, fritatta or even a wrap. Definitely. With all the hustle and bustle these days winging it is best, easy and oftentimes the most delicious! I am with you, Vicki. I like to eat chicken breast and I like it very simple just seasoned with salt, pepper and fresh herbs….your swordfish looks really meaty and tender. We rarely have swordfish and it was so meaty and tasty. In fact I feel like it has the same texture as chicken and doesn’t have that fish smell. You could fool someone who dislikes fish into thinking it was chicken. Of course, I’d never do that. At times simple is what works best for us. It is completely no fuss and gratifying. I am a rather simple sort, so simple is what I do best! 🙂 It used to drive my wife nuts to see me look at a recipe, then make the dish while changing the recipe considerably. Of course her specialty is baking, and unless you really know what you’re doing, that’s more dangerous in baking. (And I never change recipes when I’m baking; but she knows what she’s doing, so now she does it all the time — I’ve rubbed off on her!) Anyway, lovely recipe. Swordfish is always a treat. Also, for your clients who aren’t ready to free themselves from a cookbook, your post reminds me of one of Pam Anderson’s cookbooks —- called something like How to Cook Without a Book — that lays out some pretty easy rules for how some basic dishes are assembled, and can be changed. Thanks Ashley. 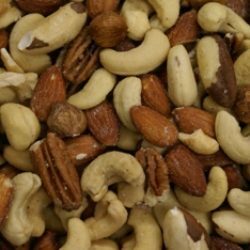 Healthy eating is the easiest way to prepare food. No heavy sauces, no slaving over the stove – just simple ingredients from the earth tossed together with some protein and grains if you like, and you’ve got a satisfying meal. I have a great library. When my husband can’t find me he looks where I have the majority of my books and there I’ll be – quietly sitting, reading them. I love grilled veggies and I’ve never tried grilling swordfish and I’m not sure i have even tried it before. It looks lovely and healthy too. I am like you I have many cook books but use them for inspiration too. Swordfish in many ways reminds me of chicken. It doesn’t have that fishy taste at all but a thick texture similar to meat. 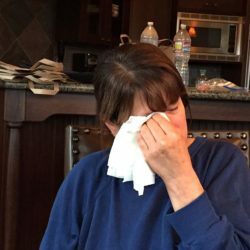 I had not made it in years and my husband gobbled it up and then some. Just a splash of olive oil, with salt and pepper was perfect, then drizzled with fresh squeezed lime juice once prepared – it was perfect! It doesn’t get much easier. 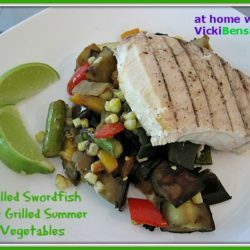 A meal made up of grilled swordfish and favorite veggies is a winner in my book-I like to keep it simple, fresh and healthy for dinner at my house 😉 I love to read cookbooks but not as enthusiastic about following a savory dinner type recipe, except when baking- I don’t want any avoidable disasters!!! I agree simple is better. Maybe on New Years and special occasions you might pull out all the stops and create something over the top. On a day to day basis though simple is the way to go IMO. As for baking I tend not to follow that always either. Sometimes I wish I had but most of the time the recipes turn out pretty good. Vicki, this is the kind of meal that I like, simple and tasty…I yet have to trill swordfish…looks delicious! Swordfish is very mild and I think it many ways resembles chicken when it comes to texture. You should give it a try. I think you’ll like it. You grocery shop just like me! My grocery list has “fruits” and “veggies” written on it because I don’t decide what to buy until I see what’s there. Cooking without a recipe is fun and my most favorite way to cook! Like you, even though I have lots of cookbooks and magazine, I very seldom cook one of the recipes. Great post Vicki! Thank you. I could get lost in Whole Foods and literally spend hours if not days there if they were open 24/7. Best place in my mind to find fresh fruit, veggies, prepared foods, breads, etc. I love whole foods, too. we don’t have one in Richmond, but when I go to Vancouver I make sure I stop there. I love your grilled swordfish with summer vegetables. Thank you, it’s very simple but delicious and light. Whole Foods is the best, even though not close by at least it’s close enough so you can visit it on occasion. 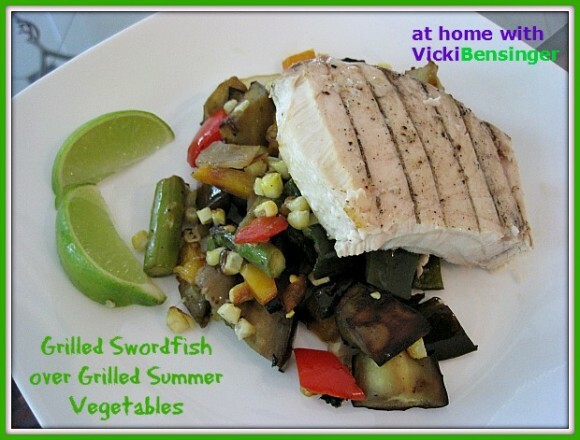 I love swordfish – so nutritious and absolutely scrumptious with grilled summer veggies. This looks mouthwatering, Vicki! Thank you Georgia. I hope you’ll try it. Looks wonderful Vickie and what a great confidence builder you are! You’re right that so many people think they need a recipe but when you make meals like this one, cooking is simple and very delicious! I love how light and simple this meal is yet it’s full of nutrition. We eat pretty light meals during the week too, and this fits how we eat at home. 🙂 I don’t cook swordfish all the time, but I enjoy eating it. Looks delicious!